Can you believe it's already August?! This is so cliche but the summer really flew by! Between my internship, my job at the boutique, our trip to Maine, and trying to having a social life, the past few months have seemed like a blur! My friends who are staying on campus will be moving back in the next 2 weeks and it's kind of just hitting me that I won't be on campus until 2018!!! I'll be leaving for my study abroad semester at the end of August and have slowly been preparing for this crazy experience! My new Madeline & Company backpack is already becoming one of my favorite things that will be coming with me abroad! I'm sure this will be my go-to for school and travel during my semester abroad and of course, when I'm back at Richmond! 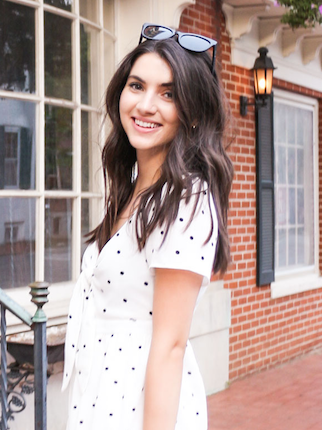 I'm so inspired by how this company started and so supportive of other #girlbosses like Madeline! 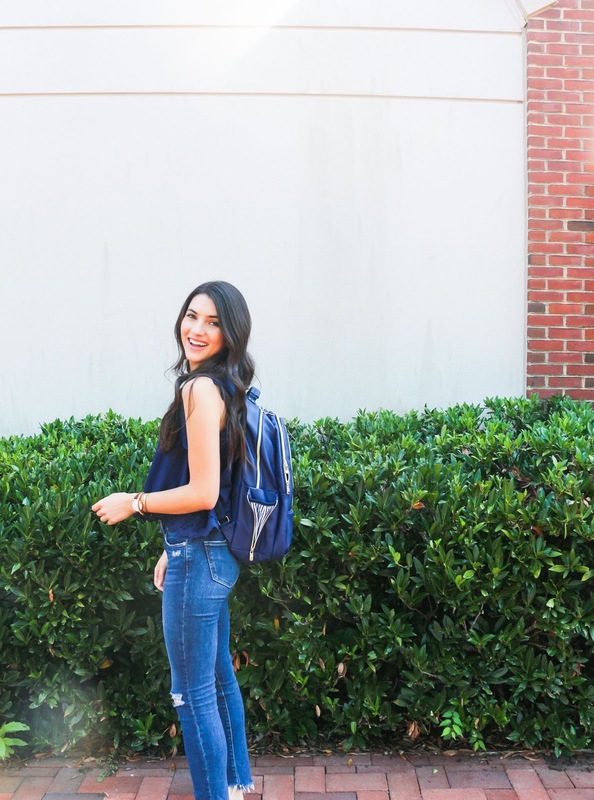 She was just starting high school when she felt that there was a lack in the market for chic and functional backpacks - so she decided to make her own! Her mom helped her out and Madeline & Company was born. 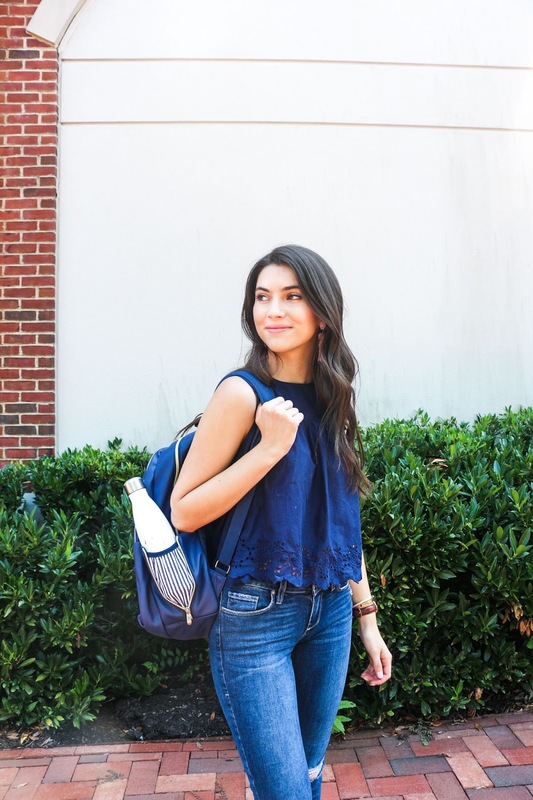 Now, it's the go-to for cute backpack for young girls, college students, and working women! 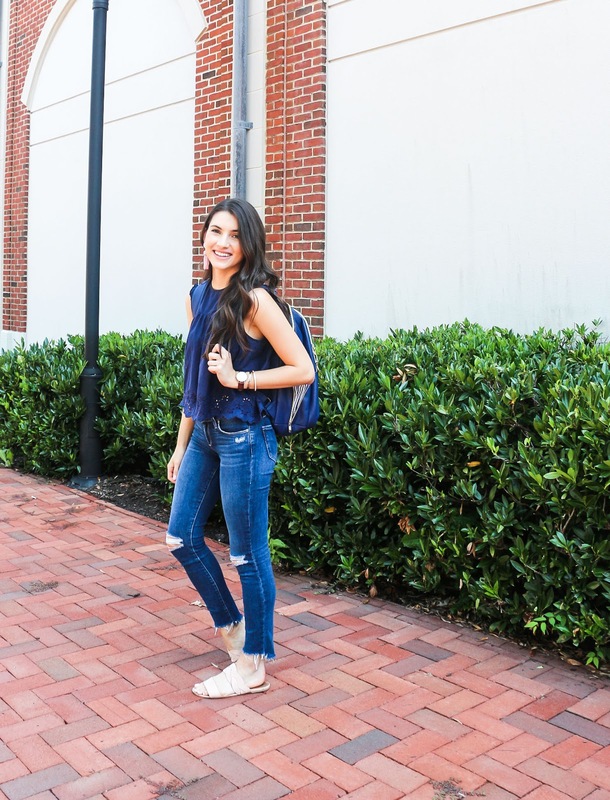 I chose this simple, navy faux leather backpack because I knew it would go with 99.9% of my closet but trust me, it was hard to resist these super cute striped ones! This outfit is something I would typically wear for a normal day of classes! Most everyone at Richmond 'dresses up' for class so I like to wear something simple, yet classy, like these jeans, a cute top and my favorite sandals. I love how functional this backpack is! There is one large pocket with a laptop sleeve built in, and the lining is a cute blue and white stripe. There's two more smaller pockets in the front and a pouch at the top for your keys, phone, money, etc.! But, my favorite part might be the cute striped detailing in the side pockets - which fits my S'well bottle perfectly! 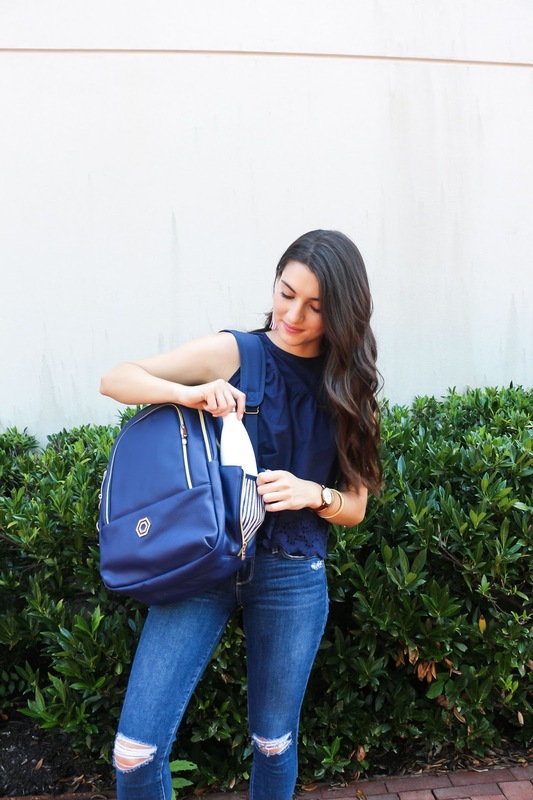 I want to help you get back to school ready so if you use the code 'BELLEADORE' you can get 15% off you purchase of a Madeline & Company backpack! Leave me a comment telling me what your favorite backpack is! I'm really digging the third to last picture! So cute.